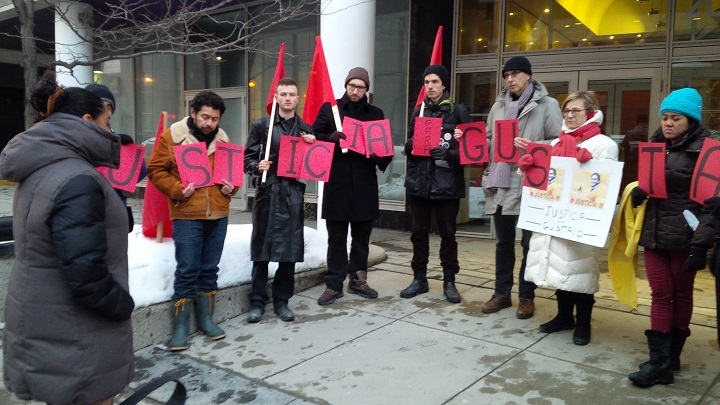 [Montréal, 4 March 2015] Today, in front of the Mexican Consulate in Montreal, we stand shoulder to shoulder with our comrades of the International League of Peoples’ Struggle in Mexico to decry the brutal abduction, torture and murder of Comrade Gustavo Salgado Delgado. In Montréal, elsewhere across Canada and around the world we are mobilizing so that this heinous crime will never be forgotten and justice will be served. 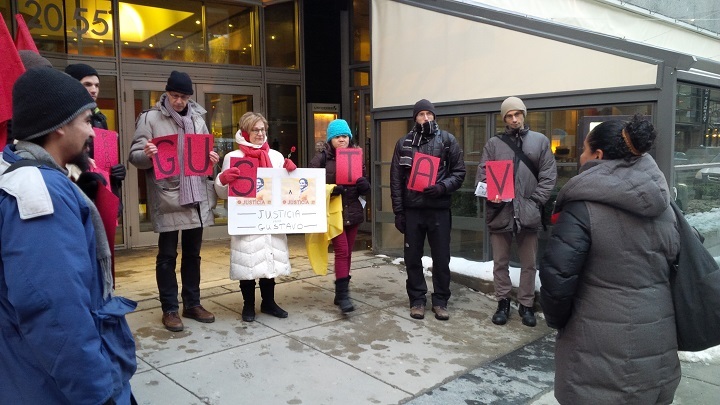 We stand here today to demand a full investigation into this crime against Gustavo and to demand that those responsible are arrested and sentenced accordingly. Today we also stand by all those in Mexico who have suffered under the present regime of terror and intimidation of Enrique Peña Nieto, which has particularly targeted those, like Gustavo, who are fighting for the defence of Mexico’s most exploited and oppressed people. Gustavo was active in the struggle to demand justice for the 43 student teachers from Ayotzinapa, and was in the front lines of the struggle to defend the rights and welfare of the indigenous people and workers of Mexico. Gustavo was found decapitated on Feb. 3, 2015, hours after being reported missing. We support the mobilization of the people of Mexico to seek justice and carry forward Gustavo’s cause for national and social liberation. Comrade Gustavo was extremely hated by the reactionary state and by the landlords because he aroused, organized and mobilized the people to fight for their political, civil, economic, social and cultural rights against oppression and exploitation. He was resolute and militant in the defense of the people’s right to the land, and demanded provision for the needs of the working people in the municipality of Ayala, especially the migrant workers from the mountainous areas of Guerrero and Oaxaca. The landlords and the state reacted against him by forcibly arresting him and illegally detaining him on March 20, 2014 in Cuernavaca, Morelos, while he was participating in a people’s march. Comrade Gustavo was a state leader of Frente Popular Revolucionario in Morelos, and was a member of the Executive Committee of the Central Committee of the Frente . He was a dedicated and energetic leader and was determined to build the FPR in the state of Morelos. His murder exposes the barbarism of the regime of Enrique Peña Nieto which is trying to impose “reforms” for the benefit of the exploiting few. The regime is using various forms of violence, including abductions, illegal detentions, and assassinations in order to suppress the people’s struggle for a better life. We stand in solidarity with the people’s resistance and encourage various forms of mobilization against the regime. We support the vibrant participation of Frente Popular Revolucionario in the People’s National Assembly, the People’s National Council and the General Political Strike. “Let’s be clear: the solution we are proposing is revolution, uprooting this rotten political, economic and social system in which these exploiters and their representatives will not have a place. For every dead, disappeared, tortured, imprisoned, and persecuted comrade, the people will settle accounts. They have taken Gustavo, they did so with Gregorio Alfonso, Lauro Juárez, Manuel Gonzalez, Gil Ramirez, among other comrades fallen in battle, as well as other comrades in the social movement. That the Mexican government assure a transparent and full investigation to ensure that all facts are uncovered and that justice is carried out fully in the case of the forced disappearance and assassination of Gustavo Alejandro Salgado Delgado. That the Frente Popular Revolutionario and the relatives of Gustavo A. Salgado Delgado are permitted immediate access to certified copies of the investigation case files and that a competent lawyer be assigned to this case. That security be guaranteed for the community of Emiliano Zapata, “El Chivatero”, the Indigenous Camp of Ayala, to the militants of the Frente Popular Revolutionario, and the relatives of Gustavo Alejandro Salgado Delgado. We demand that the Canadian government do all in its power to assure that justice is served in this case. Finally, we also demand justice for the Ayotzinapa 43 and their families and all those in Mexico suffering under the government of Peña Nieto. ¡Camarada Gustavo Salgado Delgado, Vive! ¡No pardon, no forgetting, punish the assassins! ¡Ni Perdón Ni Olvido, Castigo a los Asesinos! Surface the 43 Students and all the Disappeared! ¡Por la Presentación con vida de los 43 Estudiantes y de todos los Desaparecidos! Justicia for all those in Mexico suffering under the government of Peña Nieto! Viva el Frente Popular Revolutionario de Mexico! Long live the International League of People’s Struggle!